The First WEbooks Have Been Printed!! Not only have we completely re-designed and re-launched the site itself, but we’ve also taken a bold step into uncharted territories… we are doing what many members always thought we should – we are making the publication of WEbook books a reality. We are now proud to be able to say that we are a publisher. We publish and we print real WEbooks, by real WEbook members, for the world to buy through our WEbook store! 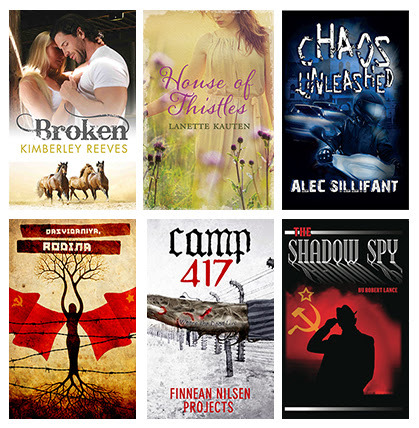 Not only are we now a publisher, but we’ve got a simply brilliant range of titles on the way – Broken by Kimberley Reeves, The Shadow Spy by Robert Lance, House of Thistles by Lanette Kauten, Camp 417 by FinneanNilsen Projects, Lifelights by AlinaVoyce, Dasvidaniya Rodina by D.S.Loren, Chaos Unleashed by AlecSillifant, Moonfall by Vanessa Morton and last, but certainly not least, Skunge by Jeff Barr. Well yes we have, but there’s a good reason for that – we’ve been trying to find the best way that we can supply WEbook titles to the store, to our customers and to our authors. We went through a lot of different options, but because the last thing that we wanted to do was compromise on quality we decided that the best way to print our titles was to find a POD printer that outshone all the others. We searched high and low before deciding upon CPI’s Antony Rowe. 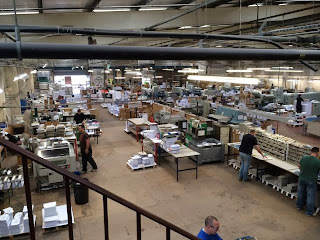 Not only is Antony Rowe perhaps the happiest factory we have ever come across - think Santa’s elves but without the silly hats and operating much heavier machinery - but it’s also a place where we know that the quality of our WEbooks is assured. We’re glad you asked – POD is short for ‘Print on Demand’ – this means that we are able to print our titles only when someone wants to have one. Not only is this great for the environment, but it’s also nice on everyone’s pockets - including the customers’. When someone makes a purchase from the wonderful new WEbook store, a very complicated piece of code sends a message to Anthony Rowe. 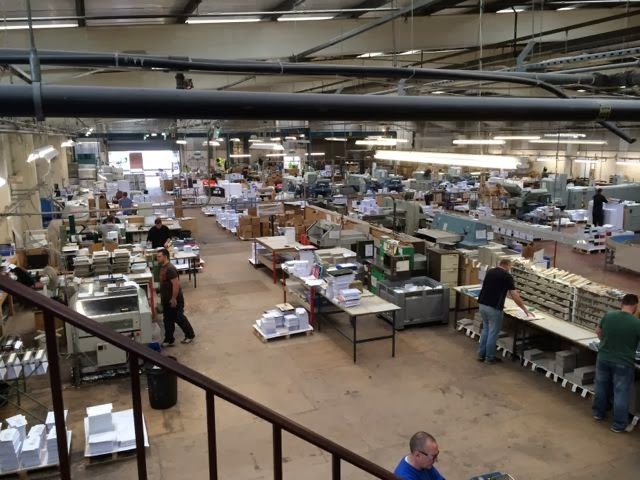 Their machines whirr into action; the book is printed, bound, packaged, and sent out directly to the customer! Easy as ABC… or is it? 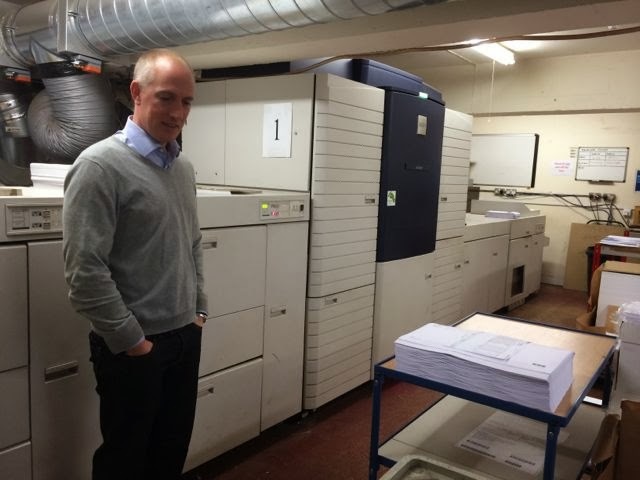 This week, we took a trip down to Eastbourne where Antony Rowe is based to see our very first WEbook title come hot off the press! awaiting reader. 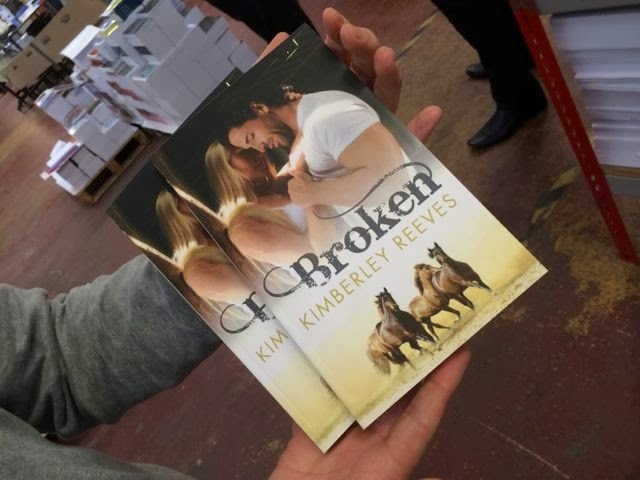 Each book is made specifically for each individual order, so when you order a WEbook think about it going through this process - especially for you! To begin with, the inside of the book is printed onto individual A3 sheets of paper, prepared as blocks. The blocks of paper you can see in the picture were fed into the machine, and all of the wonderful words written by our WEbook authors printed onto the paper - which then became the pages of our very first WEbook! So, now that all the pages were printed, it's on to the cover! The iGen 3 then printed out the cover for our book, which was then laminated as we’d requested – clever! 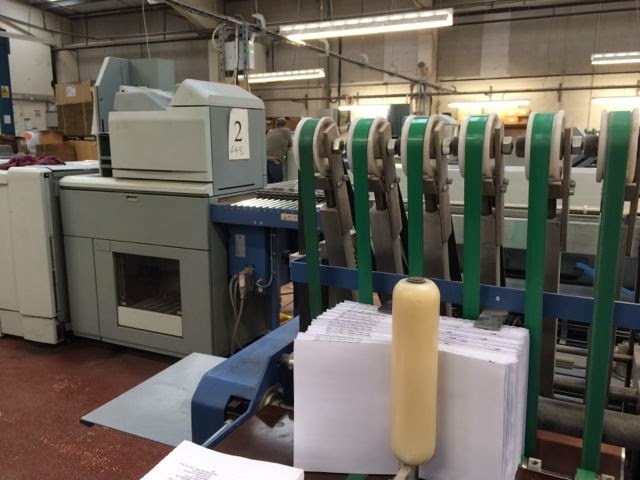 Binding is a different process for paperback and hardback books, at Antony Rowe, the hardback binding is done by hand (more on this later! ), but as we were creating paperbacks to begin with we took a closer look at how this happened first. 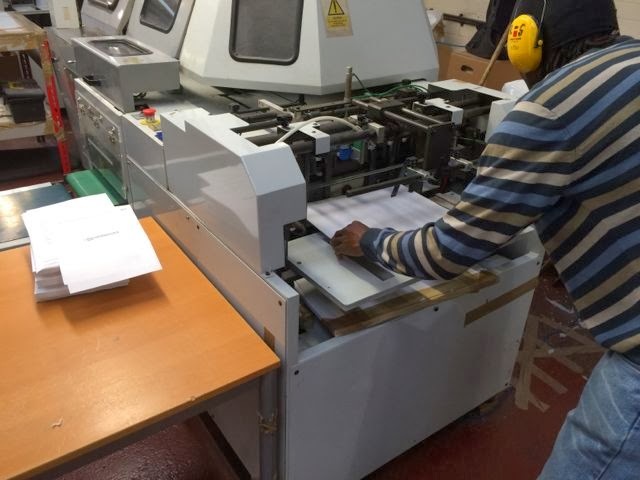 The pages are fed by hand into the machine by the nice gentleman in the picture on the right (we cannot guarantee that this exact gentleman will make your book, but we can guarantee that someone else equally as nice will be the one to do it). Then the binding machine did its magic and out popped… the uncut bound book! 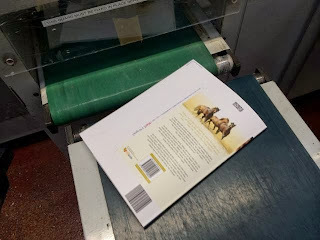 Now that we were almost there, the excitement was getting to us a little and the only thing left to do was to trim the book down to size. The machine knows exactly how small (or big) to cut each individual book because those clever barcodes keep all of the information that’s needed for this on them. There’s no opportunity for error here! 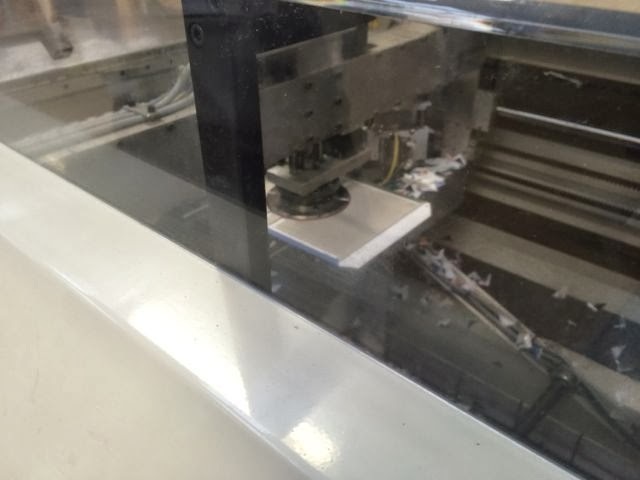 Once the book has been cut down to size… well, that’s it! So there you have it, the first ever WEbook, printed by Antony Rowe! 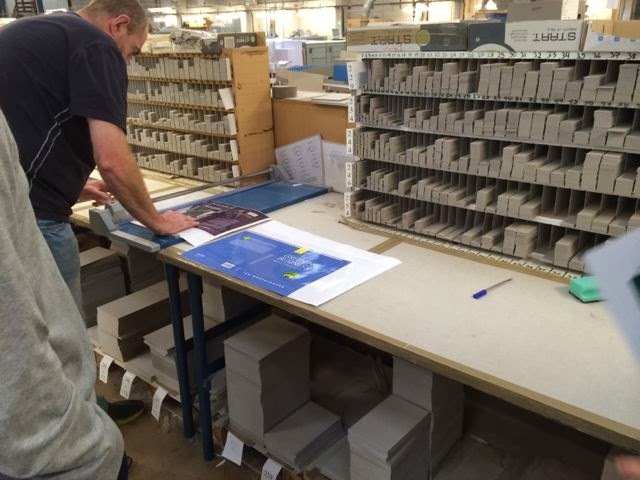 As we mentioned before, each hardback book is made by hand - in the image below you’ll be able to see one of the Antony Rowe workers measuring up the hardback cover for another client’s book. 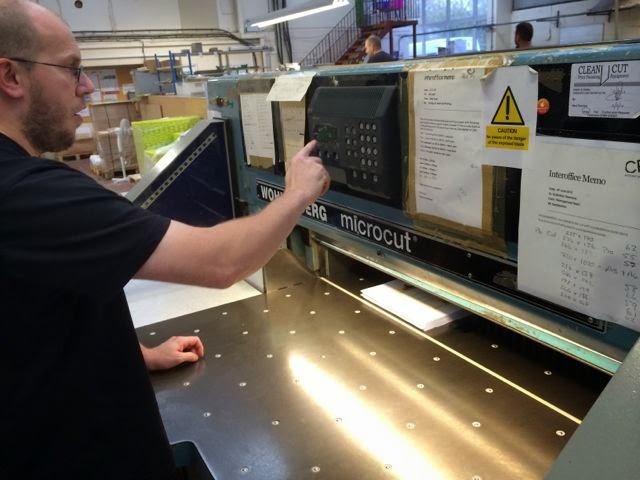 When we start to make hardback WEbooks available to buy, which we will be doing very soon, this is exactly how your copies will be made too! Once the process of sizing up the cover was complete, the book was fed into the casebound cover machine and the hardback binding was done, ready to be fed through the binder and then into the cutting machine - simple really. We’d also like to take this moment to thank the team at Antony Rowe for helping us to make this possible and for completely bowling us over with the fantastic operation that they run. I would like to personally thank the entire WEbook team for bestowing the honor on me of being the very first author to be published by WEbook. Their commitment to me and to assuring everything was perfect - from copy-editing to cover design - has been truly amazing. It is also with heartfelt gratitude that I thank the members of WEbook who devoted so many hours of their time to help me and each other prepare the novels for the first step in getting published...Ryan, Sue, Lanette, Bob, Jeff, Alec, Vanessa and Devi - you're an awesome, inspiring, talented group, and I am so proud to call you all my friends. October's WEbook Challenge - The Winners!